Fran Tarkenton played 18 seasons in the NFL for both the NY Giants and the Minnesota Vikings. During his lengthy career, Tarkenton would win an NFL MVP award, and his distinguished play would allow him to be elected to the Hall of Fame in 1986. The 1962 Topps set was printed in very low numbers and because of the black borders, the cards are very condition sensitive so highly graded Fran Tarkenton rookie cards are also quite scarce. Fewer than 10 have been graded above PSA 8. Those graded at PSA 7, of which only about 175 have been graded, sell for $150 and below. The scarcity of these cards has not equated to outlandish prices seen for many other cards. Tarkenton and Mike Ditka are two of the most valuable rookies in this set, which celebrated its 50th birthday in 2012. It's a classic set, with a black and white action photo and larger color photo on the front of the horizontally designed card. 1962 Topps are very unique in design and while not difficult to find, they are a challenge for those who like high grade cards. Although the Tarkenton rookie may not be as valuable as those of several other Hall of Fame quarterbacks in average condition, they still are a sound investment at the higher levels. In addition to the lower risk, it cannot be ignored that these cards are very scarce. Fewer than 750 examples of this card have been graded by PSA in all. Eventually, collectors are bound to notice how rare high grade 1962 Topps are and Tarkenton is one of the keys to the set. 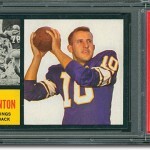 The 1962 Topps Fran Tarkenton is a nice, low risk investment that can appreciate due to its scarcity in the long term.